The following article was first written in November 1998 and has some great tips and techniques for Kite fishing in light winds. It has been updated to include new ideas. There is a down side to summer fishing however which I'm sure many kitefishers have experienced over the years. Light winds can cause even the most even-tempered person to utter a few choice words. I often hear of kitefishers catching their bag limits of fish while others on the beach on the same day with the same gear have struggled against the conditions to no avail. The difference between the two often simply coming down to technique. Over the last few months Paul and I have been working on a variety of techniques in order to maximise the chances of successfully fishing those marginal light wind conditions with delta kites. Above: Anne Malam writes "See even women can kitefish. This is part of a catch of 20 fish taken from 30 hooks at the southern end of Bayly's Beach Dargaville." We have found that in order to overcome light wind difficulties several things need to be taken into account. The size to weight ratio of the fishing kite being used is critical to its light wind fishing performance and will determine how much wind is actually required in order for the kite to fly and supply enough surplus pull to tow out your gear. A delta kite is an airfoil, like a wing on an aeroplane. If you can imagine coiling up all of the kiteline and attaching it directly to the keel of the kite, this is the actual total flying weight. If you then took this kite to the top of a skyscraper and released it on an absolutely calm day the kite would glide forward like a hang glider. The speed the released kite glides forward is the same as the wind speed which is required to keep the airborne. Fishable pull only occurs in wind speeds over and above the kites natural gliding speed. The heavier the kite the faster the glide and the greater the wind which is required to tow out the fishing gear. Out of balance kites that have a bias to one side will have an even greater gliding speed. 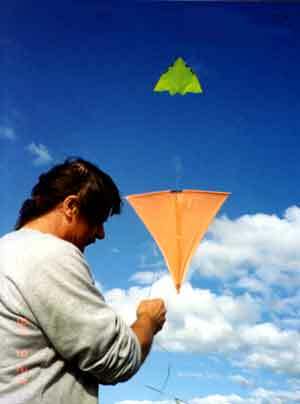 Above : A Delta kite and Skyhook rigged for light winds. The Drogue Bridle is shown attached to the wing tips and this is the simplest way of increasing drag. Some Kitefishers attach the bridle legs around the wing spar above the cross spar locators and claim it is more efficient than attaching to the wing tips in extremely light winds as it tilts the face of the kite into the wind. This prevents the kite gliding forward alltogether. There are two things you can do to an Delta kite to increase its light wind performance. You can reduce the over-all weight of the kite by changing from fibreglass rods to carbon fibre rods ( a fairly expensive way to go). Or you can increase the amount of drag on the kite in order to reduce its gliding speed (a much simpler and cheaper option). 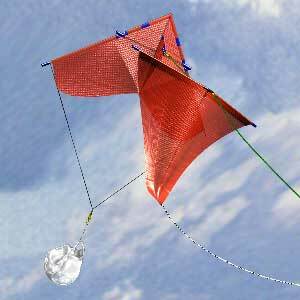 To create drag simply add a large drogue (a wind sock) or better still a plastic shopping bag to the back of the kite. Attaching a large plastic shopping bag tied through the handles by way of a bridle attached to the wing tips or over the cross spar locators will not only create enough drag on the back of the kite to slow its gliding speed, it will also keep the nose of the kite tilted upwards. This effect allows the kite to catch much lighter winds than would be possible without the parachute effect created by the bag. The bridle should be made of light weight dacron. Measure your kite from wing tip to wing tip. 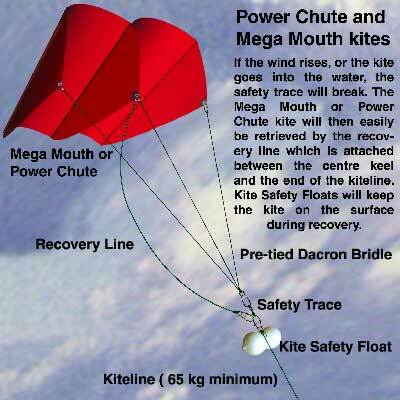 The length of the bridle needs to be about 3 times the width of the kite. Tie a snap clip to each end of the bridle. Drop both of the snap clips over a nail and pull the dacron out straight to find the centre. Tightly holding both strands of dacron, tie an overhand knot near the end of the outstretched lines leaving a small loop at the very end. This loop should now be dead centre between the two snap clips. If it is even slightly off to one side it pays to undo the knot and try again as this will cause the kite to pull to one side during flight. A second length of dacron (about 1.5 to 2 metres long) is needed for the shopping bag. Tie a snap clip with swivel at both ends. Attach the one end of line to the loop in the centre of the bridle. It is essential to place a swivel in this length of dacron to prevent the bag spinning the bridle up and making it ineffective. The bag is attached to the end of this dacron cord by passing the remaining clip through the handle holes and clipping it back over the line. This allows the bag to fill with air (like a parachute). It is not necessary to cut any holes in the bag. A skyhook is another very effective way of increasing your light wind performance. Like a spinnaker on yacht, the skyhook doubles the amount of sail area available which in turn increases the amount of fishable pull provided by the kites. A combination of both the skyhook which creates more lift and pull, and the plastic bag, which creates more drag and helps lift the skyhook into higher air and better wind, is unbeatable in marginal conditions. This type of rigging has allowed many kitefishers (including yours truly) to be able to get their gear out in those tricky light wind conditions when others have packed up and gone home. Even the small flexiwing kite gains a huge benefit from large shopping bags and when combined with the flexiwing skyhook we have achieved good fishing pull in as little as 3 knots of wind. 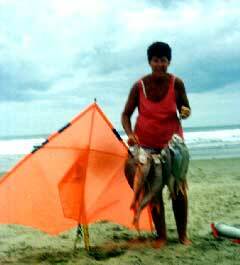 The above article relates to increasing the efficiency of delta kites in light winds because delta kites are so well proven as an extremely versatile and popular fishing kite. However, those wishing to fish in almost imperceptible or fluky breezes just can not afford to overlook the tapered ram air multi-cell sled kites like the Power Chute or Megamouth kites. These types of power kites are not an airfoil and have no tendency to glide forward whatsoever and this was clearly demonstrated at the recent Kite Day at Whenuapai Air base. Paul and I were invited to attend and demonstrate fishing kites. We phoned the weather before we left home and found the winds were 1 to 2 knots and forecast to increase to 10 by the afternoon. We arrived at 9:15 am and found the organisers of the day quite concerned about the lack of wind (it was actually a bit foggy). To help relieve her fears Paul and I launched a slightly modified (5 celled) Mega Mouth to around 600 feet altitude. Wow!!! The punters had no trouble finding where the kite display was on as the Mega Mouth acted like a beacon. Over the next hour and a half hundreds of kites of every possible description, size and shape were launched only to drift slowly back to the ground during the lulls. The Mega Mouth on the other hand continued pulling from 10 to 20 kgs throughout. As the wind increased to the forecasted 10 knots all the kites became airborne and what a spectacular sight to see. If you ever get an opportunity to go to one of these kite days I highly recommend it. On the down side, the wind was easterly and we could have been fishing!